Hey everyone, in today’s episode I share the mic with Guillaume Vidal and Cole Zucker, co-founders of Green Creative, which provides high-performance LED lighting solutions to some of the largest companies in the world. 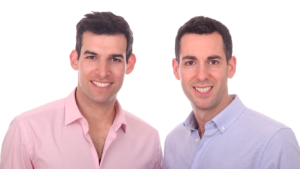 Tune in to hear Guillaume and Cole discuss the turning point that enabled Green Creative to go from $300K to $40M in sales in 5 years, the secret to their successful customer acquisition, how they base their commission structure, and why you should never underestimate industry relationships. Look for the opportunities where you can start your own business. Make a great product that people need. Aside from focusing on product development, you should pay close attention to your sales numbers and training your sales reps.
For me at that point, there was no doubt that LED technology was going to be replacing everything else. It was still very early. Don't get me wrong. But I could see the potential there. Do you want to impact the world and still turn a profit? Then you're in the right place. Welcome to Growth Everywhere. This is the show where you'll find real conversations with real entrepreneurs. They'll share everything from their biggest struggle to the exact strategies they use on a daily basis. So if you're ready for a value packed interview, listen on. Here's your host, Eric Siu. Before we jump into today's interview, if you guys could leave a review and a rating and also subscribe as well, that would be a huge help to the podcast. If you actually enjoy the content and you'd like to hear more of it, please support us by leaving us a review and subscribe to the podcast as well. Thanks so much. All right, everybody. Today we actually have two people on the show. These are the co-founders of Green Creative. This is Cole and this is Guillaume, and Green Creative, they specialize in providing high quality LED lighting products and I'll let them speak to that a little more because that's their space. Cole and Guillaume, welcome to the show. How are you guys doing? Hi Eric. Yes, thanks for having us. We're doing great. Pretty excited and actually pretty honored to be on your show today because we're one of the very few hardware company that you invited. Awesome. Why don't you guys, either one of you, you guys can talk about how you guys ended up coming up with the idea, how you guys partnered up, and go from there. This is Guillaume. I will start a little bit, give you a bit of my background because that's how we got in there. I grew up in the south of France and then did an exchange program in Hong Kong. I was really interested in international business so that was a good opportunity. I just loved it. I loved it so much that it was back in 2004 and it was supposed to be for six months, and I'm still in Asia today so clearly extended my stay. I started working there after my study for a big trading company and that's when I really put my hands for the first time on an LED product. At the time it was really just decorative bulbs. Couldn't do much with it and it was extremely expensive but that's really what got me into the technology. After about two years in the job in Hong Kong I was asked to go to mainland China to open a division for the company in Shanghai and that's when I got the chance to really build a team from scratch, open an office, manage people. So it was a fantastic experience but after about a year and a half to two years, I got a great opportunity to join a lighting factory which was one of my supplier [inaudible 00:03:02] so I thought it would make a lot of sense for me to understand what's happening inside the manufacturing and how all of these things works instead of just seeing the finished product. During this experience I was building LED product line for different markets. It's about two years in the job that I really realized two big things that were the origin of the company. One was the technology advancement were just staggering. Back in Hong Kong in 2004 it was just a very poor decorative colorful LED bulb that we could put to market, but now six years later the products were starting to be able to replace and be used in general lighting application. For me at that point, there was no doubt that LED technology was going to be replacing everything else. It was still very early. Don't get me wrong. But I could see the potential there. The other big thing that I realized was the big companies that we all know that are the legacy company in lighting, they were just not very equipped to end all this technology because now we're talking about solid state lighting. It's a tech product, and so the old kind of processes that were in place for technology that were very stable for five, six, seven years were not adequate to deal with LED. At the same time in this company, I reached a ceiling and was looking for new opportunities maybe to start something, and that's really when we got back in touch with Cole, and maybe Cole, I hand it over to you. Sounds good. Excellent, Guillaume. Eric, thanks a lot for having us on the podcast today. I wanted to go through my background a little first. I'm from New Jersey originally. I moved to Shanghai by way of New York City after living there for a year. I spent some time in Shanghai. I really wanted to learn Mandarin. That was my primary reason for going. I was also excited about the growth story of China and I wanted to see it for myself, and through a couple of random connections I was able to find a job with a Chinese factory that was producing a whole bevy of different types of building materials. One of the things that we were doing is selling into the China market and myself, I was doing mostly sales and project management there. As the lighting part was getting more and more significant within the organization, there was this little technology that we kept hearing over and over again which was LED. At the time, very similar to what Guillaume was saying, the technology wasn't there. The efficiency was low. The price was too high, and it really wasn't relevant for the market, however recognized that there was a great opportunity here. At that time which was about three years into my stint in China, I wanted to move back to the US for various reasons and saw this opportunity because as Guillaume mentioned, there was major disruption that was about to happen within the technology because at that time, fluorescent, incandescent, halogen among others, they were the primary technologies that were seen in lighting but LED was really, really small and the customers, they were buying the traditional light sources in the US. They had no idea how poorly equipped the major brands like Philips or GE were in terms of being able to bring this new technology to market because the light bulb as we all know is over 100 years old and to be honest it really hadn't changed. It hadn't seen much innovation for many decades. Seeing the opportunity and that the products were getting better, so I moved back to the US. We both downsized our lives quite dramatically. We literally bootstrapped our way to building the business. That's actually the end of the story for the first time. Great. Thanks for that. I read something online about how you guys were basically living in a car, and then somehow you guys in five years got to $40 million in sales, so what happened there exactly? That's a very good question. A lot of it was us trying to figure out this business, making a lot of mistakes, pivoting to maximize the value. Meaning once we figured out that certain products were successful, making those products better. Once we figured out who the best customers would be, because in the beginning we didn't really know who to target. We just targeted everybody. We would google, "Who buys light bulbs?" From there we would essentially pursue all those accounts, but once we started to narrow down the focus and recognize where we needed to go, that's when we realized that we would be able to grow this thing and once we figured that out we just scaled that concept over and over again meaning we hired more salespeople. We hired better rep agency. We improved our products. We were able to get a line of credit from a bank who helped to support us as we brought more inventory to the US to help grow our rising sales. Those are the types of things that really enabled us to grow from a small company which was $300,000 in sales the first year to $40 million in sales in 2015. When I look at sales over here, is your main driver, are you guys using mainly outbound sales reps to take care of ... Is that the bulk of your revenue or are you guys doing anything else when it comes to customer acquisition? We have a pretty asset light approach. The way we go to market is through sales reps, so those are commission based reps and we have them all across the country. We've got 52 of them at this point. They get a commission on everything that they sell locally, and by using them we've been able to scale very quickly because we're not bogged down by very high fixed costs on salary. At the same time we also have a great sales force out in the field managing the rep network and the distribution network as well, so we're not actually dealing with end users. We've closed a lot of accounts such as let's say Joseph A. Banks, J.Jill, J.Crew, Macy's, and this is the products that are being illuminated within the stores so it's the merchandise that's getting illuminated, but we're not actually signing contracts directly with them. We're going through the wholesale distributors, and that's been our business model and replicated that success that we had on a small basis to becoming national and rolling that out all around the country. The reps that you're paying on commission basis, I think a lot of people that are listening right now would be interested in how you're structuring that. How do you find these people, and then how do you base your commission structure? The way that we find them is actually quite easy because within the lighting industry, the reps hold a lot of power and so it's easy to google them or look at competitor websites to see who's representing them in the local territories. From there we contact them, see if they're interested in working with us and representing our brand in the local territory for example. In northern California we work with a rep agent called ALR. They also represent Philips among other brands. They were willing to take us on and invest in our business in the sense that they took us out to the local market, but the way that we found these reps. It's wasn't rocket science. A lot of it was about knowing who you are, knowing how you can help them to make more money together, and being able to pitch that correctly because if you're not, you're pretty much just like everybody else who's calling them all day long trying to get the lines represented, so it's very important for us. It was at least in the beginning, now as well, that we have a strong marketing story as to why our company should exist in the market but also why we can help them make money, because in the end of the day that's what they're motivated by. Got it. What does the commission structure look like? Twenty, 30, 40, 50%? It really depends on the product. It's all over the place, but we're talking about a product that doesn't cost that much so you can imagine the margins are tighter because it's more commoditized. As a result, we're not paying significant amounts. It's small but it's more of a volume play for them as opposed to a high end decorative product which is more margin focused. Got it. For your biggest deal size, what's the range on that? I know you've worked with some really big companies. I just want the audience to get a sense of how big these can go. Through distribution, some of our deals have been upwards of a million dollars on one job if it's a national rollout. A lot of the business that we do is order fulfillment, small orders. I call this "replenishment." We get an order for 12 to 18 pieces shipping out to a distributor somewhere around the country, and then from there it's our job to fulfill those on a timely basis but we do get a lot of these big projects that we go after as well. It's about 50/50 in terms of the big projects versus the everyday stock and flow that I just mentioned. Got it. Your sales reps, it sounds like they've got a lot of experience in this world already. I guess I should back up a second. In one of the things that I read, basically this industry's been along for a long time, the lighting industry, so you guys had to break into an industry where there's a lot of relationships that have spanned generations and you guys are basically coming into this as nobodies initially. So how do you even get these meetings initially? I think a lot of people that listen to this, they want to talk to these big companies too, but how did you guys do it? Maybe I can take that. Initially, the idea was that we would go out there and tell all those guys that we have a better product and they should partner with us and forget about their relationship for the last 20, 30 years. We completely underestimated the task, and it's not until we really started having a bit of traction and some very good product that it became real. One of the thing that we always invested very heavily on was the product, and we clearly had a number of superior products back then that was not available from any of the major guys, so people who understood lighting saw that and some of them decided to give us a shot. It was really one at a time. The other thing that happened to us that we're very fortunate about is we had Jerry Mix who is an industry veteran. He had set up and built a number of very successful businesses in the lighting industry, and he invested in our company in year two. We were able to leverage some of his network. I mean, having his money was great. That saved us, but the most value coming from him was really the network and the understanding of this industry. Very superior product. Just a lot of knocking doors and one investor that was in the industry. That's really how we managed to develop the business. Now that you guys were doing over $40 million in sales, you guys have these relationships already. The sales team seems to be established. Is there anything else that you guys would consider you guys are doing unique in terms of acquiring more customers? We're still investing a lot in R&D and I think that's what we have to keep doing to stay very innovative. To give you an idea last year, and people are saying now the industry is stabilizing and so on, but just last year we got the CNET Best LED design of the year. We got a lot of Illuminating Engineering Society award. This is the Golden Globes of lighting. We just won the Sapphire Award. We're best product of the year on the Edison Report. By really focusing on bringing the best product and innovating, this is our best form of advertising and acquiring new customers. As a result, we are acquiring one customer a day on average, and that's a lot because we're talking about a wholesale account, so it seems to be working very well. Great. I want to go back to the sales reps thing because you guys have sales reps across the US, and so how do you guys manage 52 sales reps based on commission only? Because it sounds like this is something that can fall off the rails pretty quickly. We have a number of regional sales managers. The organization is one regional sales manager is going to have a territory of a couple of states and he's going to work this territory and partner with the reps, train them, but also help them because there is a lot of times when the rep is representing more than one brand so they don't have the best knowledge of our product line. Our regional sales manager, we have an amazing team. They're the best in the business no doubt, and so they're going to go along with the reps to visit customers. They're going to learn about the products. In addition to this, we have a lot of KPIs going as far as how many accounts are on the territory, how many new accounts are being opened on the territory, as well as what's the performance of those accounts. With the local presence of the regional manager and a good number of KPIs monitoring the performance, we're able to have a pretty successful relationship with the reps. Another thing is we try to put ourself in their shoes. We're trained to help them a lot and bring them all the tools they need as far as sales tools, sample case, so we're doing a lot in the sense and I'm guessing they are feeling that there is a real partnership there so they want to promote our products. Great. These sales managers, how do they get paid? The sales manager are paid, it's a mix of ... They have a base salary and then they're also going to be commission based. Okay, and what does the base look like and what's the commission percentage typically? What's the actual numbers for the base? And you can give me a range. You don't have to give me an exact. I just want the audience to know hey, here's what it might look like potentially. Range for the salary and then a range percentage wise for commission. It's actually a little bit sensitive, this topic. We're in a competitive industry so I don't want to get too much into details here. A very rough range, and it's going to vary a lot depending on the experience and the type of accounts and the type of territory as well, but usually we try to have something around the $100K range for the base and then it's going to be a small percentage of the product. Anything between 0 to 5% on the product sale. Got it. Okay, that's very helpful. Tell us about one big struggle you've faced while growing this business. One of them probably was the fact that we started completely bootstrapped and we didn't raise any money. On top of this, neither Cole nor myself were really focused on the numbers. As crazy as it sounds, entirely focused on building the best products and making it happen. He was completely focused on developing the sales and so it happened a couple of times where we were close to not being able to pay all the payables, so we were really in a tough spot a couple of times as a result of us not really watching the numbers. We were just trying to go as fast as possible. Let's grow the business. Let's get more products in. Let's get more product out. Really, we had a couple of times where we had to raise money when we realized 30 days later all those payables were due and we didn't have the money to make it. That was a really tough time and so I think that really paying attention to the numbers and starting with a little bit more money would have been a great idea. Did you guys raise money or did you guys take out a loan? How did you get past that point? We did two things. Since the beginning of the company actually, we tried to get loans but as you know it's very difficult for a new business to get loan and especially when one of the owners is a foreign [inaudible 00:21:17]. What we did then is really literally knock on all the doors and try to raise money with families and friends, and then one of the lucky moment was as I mentioned when Jerry Mix invested. In this case we managed to raise a bit of money to get us through those bumps, and then the fact that we started very early to talk to banks and understand their requirements became very handy because in year three, which is very early for a business to get financing, we actually managed to get some initial financing. It was New Resource Bank. Actually they have a branch in San Francisco and they're focused on clean technology or environment friendly businesses and they were able to give us our first line of credit and that really helped us go through those bumps. I think we started being the smallest customer receiving a credit line and we had to leave the bank because we outgrown them three years later. Great guys. What's the best way to find you guys online? This has been awesome. You can find us on LinkedIn and otherwise our company website, GreenCreative.com. Awesome. Thanks so much for doing this. Thanks for listening to this episode of Growth Everywhere. If you loved what you heard, be sure to head back to GrowthEverywhere.com for today's show notes and a ton of additional resources. But before you go, hit the subscribe button to avoid missing out on next week's value packed interview. Enjoy the rest of your week and remember to take action and continue growing.